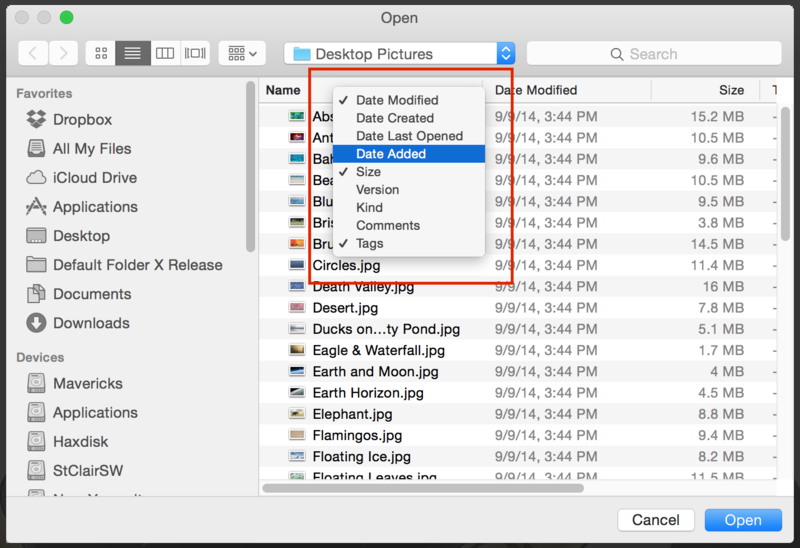 I haven’t seen this little Yosemite tidbit anywhere on the web and have had people request it as a feature in Default Folder X, so I know it’ll help at least a few folks out there. In the Open and Save dialogs of Cocoa applications (Safari, Preview, Pages, etc) you can right-click on the column headers to get a popup menu to change which columns are displayed in all of your file dialogs. Simply turn the checkboxes off and on by selecting items from the menu. Once you’ve got the columns you want, you can rearrange them by clicking on a particular column header and dragging it left or right. As I said, the popup menu is only available in Cocoa applications, but the changes you make will take effect in all of your applications – even Carbon apps (like Chrome, Word, Excel, etc) that don’t have the popup menu. This entry was posted on Tuesday, March 31st, 2015 at 6:40 pm	and is filed under Default Folder X, Tips, Yosemite. You can follow any responses to this entry through the RSS 2.0 feed. You can leave a response, or trackback from your own site. This isn’t just a Yosemite tidbit. Here’s a screenshot of the same pop-up menu in Snow Leopard. Wow – I can’t believe I never knew about it before! I’ve been looking to find a way to choose what columns are viewed in DFX for as long as I can remember (all the way back to Leopard). Then, today, finally had a spare minute and decided to actively search for a solution and found this. All I can say is… Hip Hip Hoooooooray !!!! !